I think they're all lovely! How long does it take you to make an image- on average? 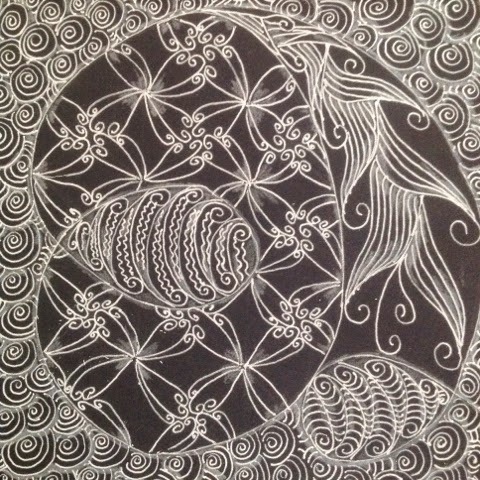 Most Zentangle tiles I create take about an hour once I have an idea of how I want the image to look. The time goes by quickly because you're making repetitive strokes. I did tell you, Deedles that my maiden name is Jones.. Your mufu and I could be related! Ha! I remember! There is a good chance of your being related. Mufu is a Jones in two different branches of the family! Ah, the south *snicker*. I enjoyed your Post, Yukari. All of your posts are so Beautiful. You create such creative designs and your Tiles are awesome. Well done. Thank you, David! 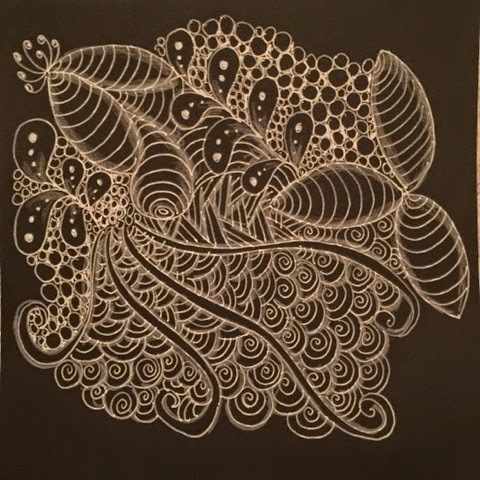 I fell in love Zentangle as soon as I learned about it over a year ago. I'm just glad I get a chance to see so many beautiful pieces done by others and to share mine as well. Thank you for stopping by. Your black tiles have a frothy quality that is just beautiful! I love your color tile, but the last mandala image is just stunning! Such nice work! Yukari, you somehow managed to create a lace effect with your white on black tiles.I found my white tangling implements to be too clunky to create anything delicate and nuanced like you did. Very nice. All are wonderful! Especially I like the first one with its wonderful flow! I know I always comment the same, but what can I do?!? It's SO pretty! I loved all your pieces, Yukari. If you are not happy with a white colored pencil, try a white charcoal pencil and blending stump for shading. I think you did well with the pencil though. I used to be an art teacher and would even teach my 1st graders how to use a compass to make beautiful shapes and designs. They had no idea they were doing geometry! You are a natural at tangling. 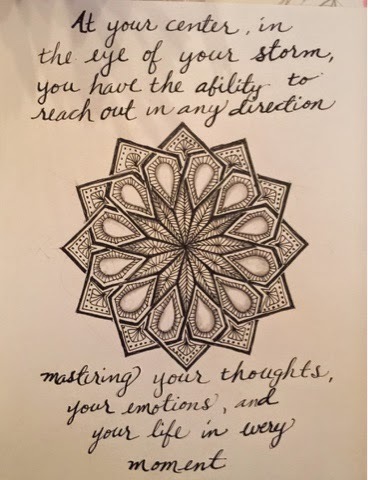 Do remember though that the goal of Zentangle is the process, not the outcome. So, relax, be mindful, and enjoy. the islamic geometry art if wonderful...not sure if I have the patience. I'll leave that one to Wayne, but your white on black is great too!There are so many tangles to appreciate in your work! All of your pieces are lovely but I really like the mandala and the quote around it. Lovely work! Lovely work, Yukari! Especially your first Dive tile is my favorite. Lovely work. Your black and white tiles are very delicate and elegant.mairy and lacy. Beautiful. Very cool how you added Rixty with Quandary! 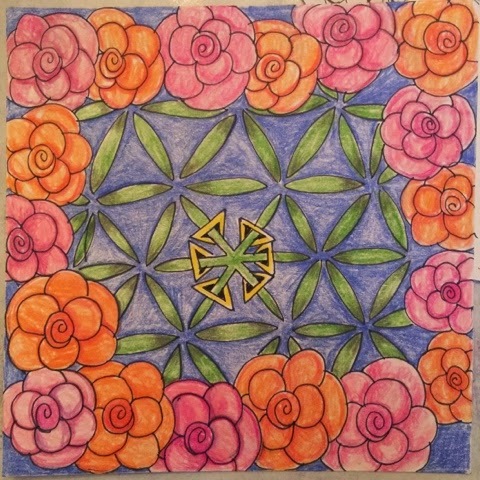 Your mandala is awesome. I love your white on black in the first tile. It turned out gorgeous. The Pozer tile is so springlike that it really makes me smile. I love the way your tangles flow in that one. And your mandala is amazing. You have such a steady hand with it. It's stunning. All of your work is beautifully done.